Jimmy Jib, Losmandy Porta-Jib, EZFX EZ Jib, Pan and Tilt heads. Available in 13', 19', 25', 30', 35', 40'. Works with film & video cameras up to 50lb @ 30ft length and 25 lbs @ 40ft. - Head can be overslung or underslung. - Triangular aluminum tubing for srength. - "Cable Leveling" design eliminates heavy tie rods. - Tapered locking joints eliminate flex. - 600 degrees of rotation without slip rings. Complete remote system with hardware for Losmandy and other jibs. Can function independently on a manual only jib or makes a great insurance policy as a complete mechanical and electronic replacement for anything that might not function on a big live show. Can operate up to 300ft away from base. 50lb (22.7kg) camera capacity. Designed to carry up to 100 lbs. (45kg) of camera and fluid head weight, this is the most versatile of all lightweight jibs. Assembles in less than 5 minutes. No tools required. All parts are machined aluminum and stainless steel. Boom and pan lock included. Front inserts available for all standard fluid heads: 100mm, 150mm, Mitchell. - Extra counter weights will be needed. It takes 30 lbs. to balance the extended front, and the camera/fluid head needs 2.2X weight to balance. Designed for videographers and 16mm cinematographers who need to travel light. Weighing only 29 lbs. (13.2kg), it supports 40 lbs. (18kg) of camera and fluid head. So compact, it folds up with no loose parts and fits into a baby tripod case. Its unique telescopic design allows it to work in constricted areas and also unfold to create a dramatic 6 foot lift. And best of all, it uses the 100mm style tripod and head you already own. 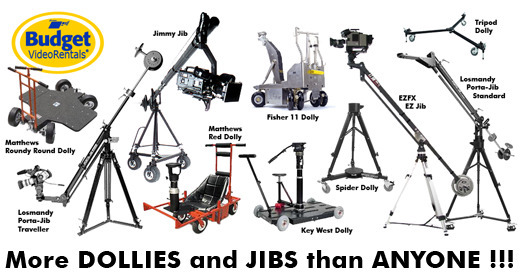 The EZ Jib arm is a portable, user friendly and the most versatile Jib arm in the production industry. Cost effective, user friendly and versatile are the attributes that set the EZ Jib arm apart from all others. Add production value and get the sophisticated look of moving camera shots in your productions. Save valuable production time by setting up your static shots very quickly. With the new stabilizer feature you can also do your tripod shots directly from the jib without removing the camera from the jib. The EZ Jib Extension Kit is really two extensions in one and can be used at either the 3.5 foot length (1 meter) or the 7 foot length (2 meters). The VZ-MC100 Pan and Tilt control system for all camcorders up to 20 lbs. VariZoom has created a brand new lightweight and extremely portable remote head, weighing only 8 lb. The VZ-MC series pan and tilt heads allow for remarkably fast set-ups. VariZoom has compacted all of the electronics necessary to drive the precision pan and tilt head into one small control housing, allowing for portability and versatility. Just mount the VZ-MC remote head on a tripod or jib plug into the supplied cord leading to the control handle power up your control handle by battery or with the supplied ac power supply and you're ready to go. Note! We recommend mounting the MC100 on a 100mm bowl-type tripod since it will fit snugly and enable you to thread the supplied bolt through the MC100 mounting plate and down through the bowl of the tripod. The Libec JB-30 Heavy Duty Kit with T102 Tripod and DL-8 Dolly is a full-featured jib that supports film or video cameras weighing up to 44 lbs (20 kg). The head attachment is adaptable between 75mm and 100mm, and may be reversed when an ant's-eye point of view is desired. Standard barbell-type plates (not included) are employed for the counterweight, and the whole assembly sets up and breaks down in a simple, logical manner. Fast, logical setup and breakdown procedure .